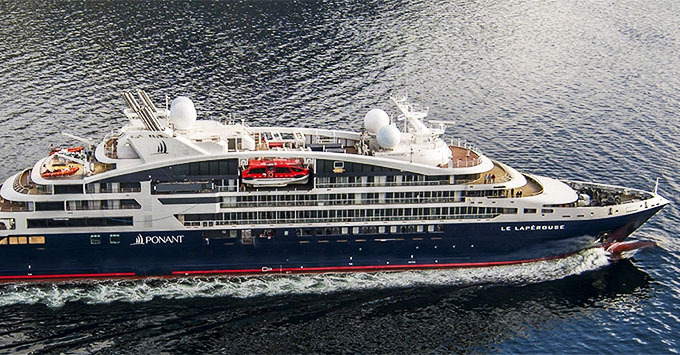 (3.10 p.m. AEST) – Ponant has released its new 2019/20 cruise voyages brochure featuring more than 100 small ship cruises and luxury expeditions. Highlights include the chance to watch the start of the Rolex 75th Sydney to Hobart yacht race and join the yachts in Hobart for the festivities, cruising through New Zealand’s fiordlands, scuba diving in Micronesia’s Chuuk lagoon, and the chance to spend Christmas or New Year in the Antarctic on a polar voyage. A range of tropical and polar expeditions were also developed in conjunction with National Geographic for inclusion in the brochure. Ponant’s new ship Le Laperouse is included in the new brochure and will arrive in Australia early in 2019 for voyages featuring destinations such as the Great Barrier Reef, Kimberley, Sub Antarctic Islands and New Zealand waters. “Treasures of the Pacific”, a 12-night expedition voyage, visits New Caledonia, Vanuatu and the Solomon Islands and incudes a stop at Tanna which is home to an active volcano. Le Laperouse will also travel from Singapore to Darwin to explore the remote islands of Indonesia including the Tembelan Islands, Komodo, Flores and Alor. The ship’s Darwin to Cairns voyage in December 2019 was developed in conjunction with National Geographic Expeditions and visits Wurrumiyanga (Tiwi Islands), Elcho Island, Yirrkala, and Asmat. There is also an extensive 39-night grand voyage simply entitled “Pacific Islands” which travels from Easter Island to Guam, calling at Pitcairn and Gambier Islands, French Polynesia, the Cook Islands, Samoa, Wallis and Futuna, Fiji, Vanuatu, the Solomon Islands, Papua New Guinea and finishing in Micronesia.